AVAILABLE FOR: auditions, rehearsals, classroom, meetings. Available weekends, days, and evenings pending Aurora production schedule. We do not rent the space for productions. SPACE DIMENSIONS: 14’-0” wide X 30’-0” deep: Actual stage floor dimension not including seating area. SPACE DESCRIPTION: A ¾ thrust stage with crossover hall on south end and green room/ crossover on north end. Seating is permanent with risers on 3 sides. Grid (catwalks above stage) is at 21’- 0” with wrap-around catwalks on 3 sides. Lighting and sound package is available. All public and backstage areas are HC accessible. SPECIAL FEATURES: This is a new theatre - construction was completed October 2001. INTERESTED? Contact Cameron Swartzell, Technical Director/Production Coordinator, by email at cswartzell [at] auroratheatre [dot] org or call (510) 750-7423. $50/hour 3 hour minimum rental preferred. The Dashow can be configured with seating and risers (see image above right) for an additional cost; please contact Aurora for details. $10/hour additional after 5pm and any weekend time for Aurora Theatre Company staff to be present (required). AVAILABLE FOR: Auditions, rehearsals, classes, meetings. Available weekends, days and evenings but with limited availability during Aurora productions. We do not rent the space for productions. SPACE DESCRIPTION: A large room with 18’-0” ceiling, hard wood maple floor and acoustically isolated. HC accessible via personal lift. 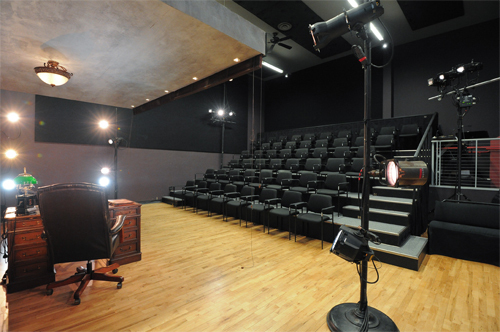 The space can be configured with seating and risers for an additional cost. SPECIAL FEATURES: This is a new space - construction completed September 2009. INTERESTED? Contact Cameron Swartzell, Technical Director/Production Coordinator by email at cswartzell [at] auroratheatre [dot] org or call (510) 750-7423.